Studies have found that the bright lights and glazing of towering structures in US cities including New York, Chicago and Los Angeles are causing millions of migratory birds to die each year. A study published by Cornell Lab of Ornithology this week ranked 125 US cities based on the danger they pose to birds. 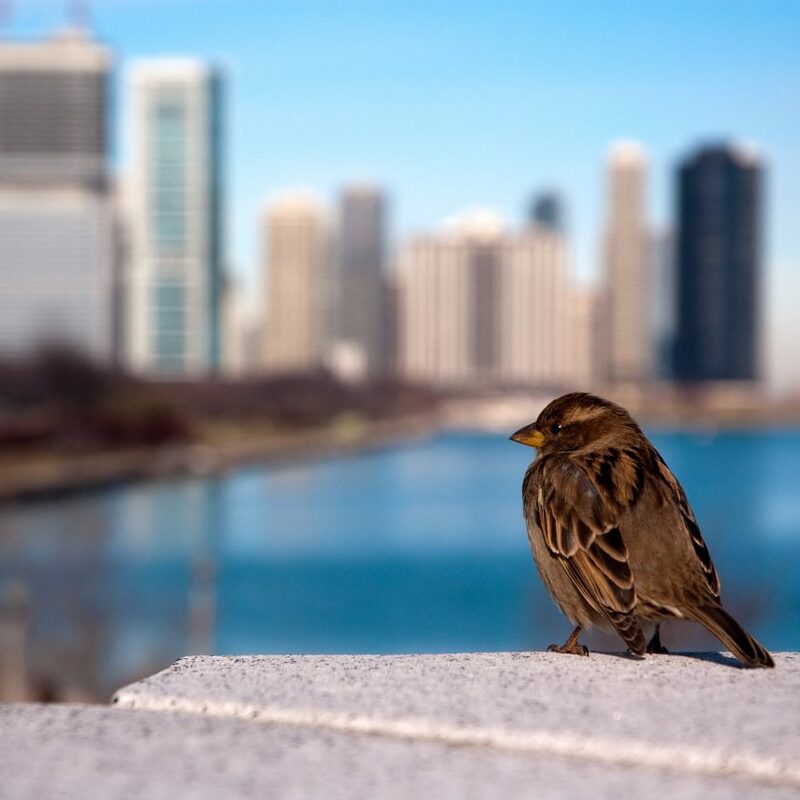 It found that Chicago is one of the most popular migration paths for birds in the US, and therefore the most dangerous. The dense metropolitan areas of New York City and Los Angeles, which features hundreds of glass skyscrapers, are also deadly. This recent research is a continuation of a 2014 study produced in The Condor: Ornithological Applications journal, which estimated that between 100 million and one billion birds are killed annually in the US. Migratory birds are at most risk, the study found, because they are attracted to the great building’s artificial light during nocturnal flight in big cities. Another study published this week by the University of Michigan follows this analysis and reveals that certain type of migrating birds tends to collude with illuminated buildings more often. The university, which also investigated Chicago along with Ohio city Cleveland, found that songbirds, specifically, are most likely to suffer. The analysis of nighttime songbird collisions suggests that birds, after being disoriented by artificial light from illuminated buildings at night, send out flight calls or chips. These lured other nearby birds to their deaths. The data, too, revealed that migratory birds are more at-risk to dying from building collisions than others. The Smithsonian’s migratory bird centre also projects the number of deaths in the US to be between 100 million and one billion for bird deaths every year. Many initiatives have started in cities to combat migratory bird deaths. They involve guides for building new buildings and tailoring existing structures, so they are more attuned to birds in flight. A design guide by the San Francisco Planning Department, published in 2011, advises for certain types of glass that deter birds. The study notes that buildings within 300 feet of an urban bird refuge are hazardous. The study also finds that buildings with uninterrupted glazed segments 24 square feet (2.23 square metres) or larger pose serious risks. It suggests preferred facade finishes to be glass that reflects ultraviolet light and glass that has photovoltaic cells embedded. Other glazed options are dichroic, fritted and etched glass. A result of this research on glazing is a home in Italy by Peter Pichler, which has been designed with a glare-reducing film to help prevent bird collisions. Toronto also released a guide with “best practices for bird-friendly glass, published back in 2007″. This work has been copied by several cities across North America demonstrating Toronto’s leadership in this key environmental policy area,” it said. A handful of conservation and ecology groups have brought further awareness to these efforts. Lights Out by the National Audubon Society advocates for reducing building’s lights during migration waves, because migrating birds can be attracted to this brightness. In China, McGregor Coxall has designed a wetland sanctuary for migrating birds as a stopover to fuel up and breed. This route through Tianjin, China sees 50 million birds journeying from the Arctic Circle to Australia and New Zealand. Dezeen has published a handful of bird observatories, including a facility in the United Arab Emirates by X Architects, a set of weathering steel pavilions in Toronto by Plant Architect, and a concrete house in Singapore by WOW Architects. Other projects are a rammed earth centre in Switzerland by MLZD and a bird observation and park in Portugal by Topiaris Landscape Architecture. Image is courtesy of Shutterstock. The post US skyscrapers kill millions of birds a year, reports find appeared first on Dezeen.